Nutley, NJ., May 5, 2011 – Gail’s Angels Foundation announced today that at the recent “Neighbors Helping Neighbors” charity dinner to benefit Gail’s Angels, they presented a new MacBook Pro Computer to Tyler Banuls. Tyler is an aspiring, young graphic artist who happens to be autistic. Now, Tyler will be able to participate in a college sponsored program for gifted children and express himself even more thanks to the creative powers of his new MacBook. “Neighbors Helping Neighbors” is a group of elected officials, community leaders, business owners, and local residents who are committed to improving the lives of others. All proceeds from their recent gala charity event at San Carlo Restaurant will benefit the Nutley based Gail’s Angels Foundation. “Tyler is such a great, young kid,” expresses James R. Babai, President of Gail’s Angels at the San Carlo fundraising dinner. “I expect to see Tyler on stage some day accepting his Oscar or Emmy for Graphic Artist of the year! We are so happy that Gail’s Angels can help make Tyler’s dreams come true,” continues Babai. Gail’s Angels is a non profit 501C charity foundation dedicated to supporting women with breast cancer who have an autistic or special needs child. 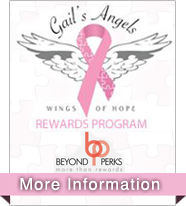 For additional information you can contact Mr. Babai at jrbabai@gailsangels.org.